Tube mats are ideal for wet areas, such as pools or showers, and can eliminate fatigue and prevent slips and falls. This is important because in wet areas, there is a higher chance of slipping and falling, and so a mat like the tube mat can help prevent slips and falls. The tube mat also provides anti-fatigue qualities, to provide provide comfort and eliminate sore and tired legs, feet, and back. 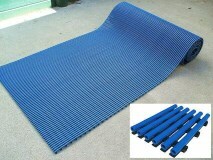 The tube mat is also soft and flexible, with tubular sections being fused together to form the mat. Tube mats can be used in swimming pool areas (as a swimming pool mat), as it is an ideal mat in wet areas, helping to prevent slips and falls. Other similar wet areas such as shower areas are also excellent areas to use the tube mat, as the anti-fatigue qualities provide comfort while using the mat. Some other examples of areas that may get wet are behind bar counters and in laundry areas, and so a tube mat is perfect for these areas. Areas that are wet or areas where drainage is essential would benefit from the use of a tube mat, as the tube mat allows liquids to drain through the mat. Other qualities that make the tube mat a great choice for these areas include the fact that the tube mat will not rot, it provides comfort and prevents slips and falls, and is also impervious to water, oils, and grease. The anti-fatigue qualities also make the tube mat a great choice for wet areas that require standing for periods of time. Mats-R-Us provides free shipping of the tube mat to anywhere in New Zealand, so contact us now to order your tube mat today, or order online through our website.